The interview with artist Antonin Fourneau, creator of Water Light Graffiti, was conducted via email in April 2013. Photos and video of Water Light Graffiti were taken at Grohe Live Center, NYC Design Week, May 13, 2013. Other photos and videos are provided by the artist. Generactive : Your project, Water Light Graffiti (WLG) looks like water gun play meeting graffiti art in a very beautifully executed way. You spray water at the wall, touch the wall with a wet finger, or paint brush it with water, and the wall brightens up. When the water evaporates, the light gradually dims. You can see the gradation of the brightness depending on the amount of the water on the wall’s surface. 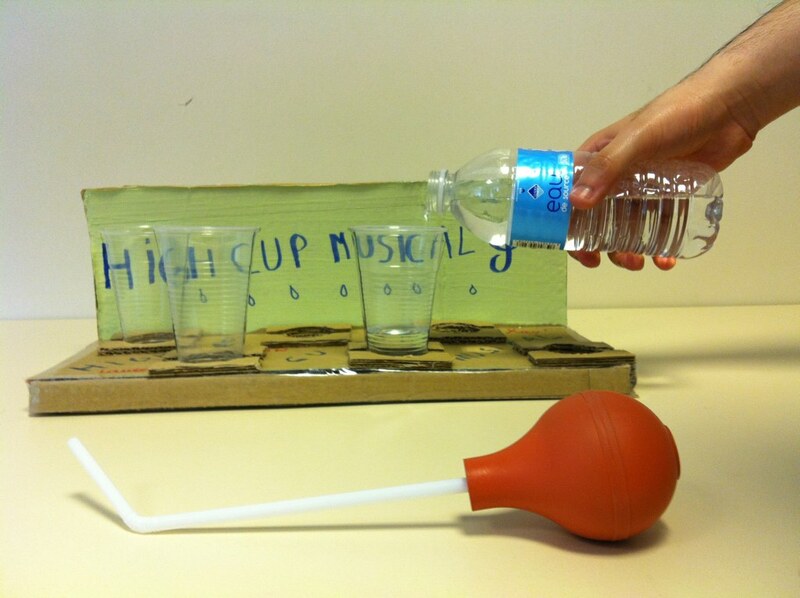 Would you like to describe this project in more proper detail and tell us what was the motivation behind this project? 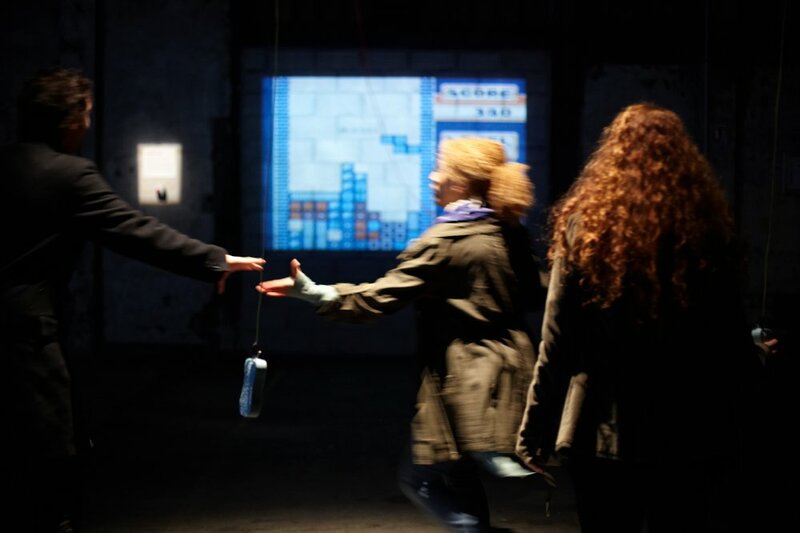 in this installation wet sponge allow to connect people together to trigger an action in the Tetris game exactly like a MaKey MaKey, in fact in you disassemble a Nintendo Game controller you have already inside a pull up resistor and if you put your finger on the pad directly on the PCB you triggering the actions. in this dinner with my research team in design school I’ve used the chopstick and contact with the wet sushi to creat a sort of musical environment. The led dim in the contact of the tongue. A sort of prothesis for a new kind of communication. This is during this workshop than the idea of WLG grow up. I was in a park for the lunch and an old guy drew with water on the ground. My motivation is always to find new canal of interaction with the public. And the street fascinate me more and more currently. Create gameplay in streets is a interesting challenge. Also the ephemeral in the asian culture intrigue me a lot. Generactive : You said (at the Digitalarti interview) that this project can be autonomous, responsive to the falling rain, for instance. Is there a future plan for this piece, such as making it a weather responsive architectural project? Fourneau : Yes during the first part of my residencies my interest was to develop a new kind of materials for architecture. In fact the time process to produce a sustainable material needs more time than the prototype. But I’m in contact with some architect interested by the project. I find interesting to produce a material in reaction with the human and also with natural phenomena. Fourneau : No I use just 5 volts. 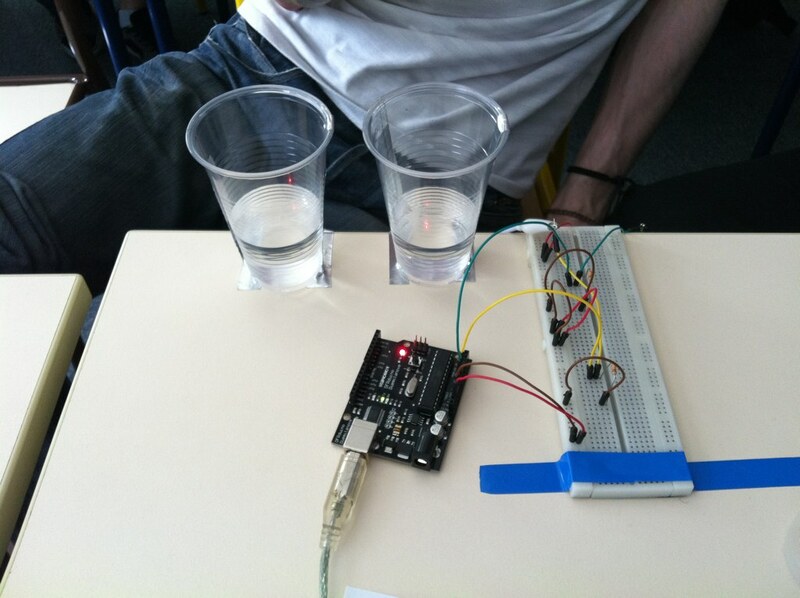 It’s quite simple I use water as a bridge to conduct electricity around each Led. A larger part of my job after find this simple idea was to optimize the fabrication and the design of the WLG tiles. Generactive : (In your portfolio) Douglas Edric Stanley at Aix-en-Provence School of Art describes the secret ingredient in your art, where you go beyond your many inspirations and define yourself with an integrated artistic identity (Hope it’s not too far from what he meant), is a sophisticated form of amateurism. What do you think about his interpretation? Fourneau : He was my teacher for 5 years and we are still working today often on one of my projects: a contemporary fun fair revisited. And Douglas is certainly one of those most able to analyze the way I work. And its interpretation is very fair. I really like the hack, I’m not a great engineer but I like all the time discover new things and experimenting with. born in the era of the video game I’m always questioning me about how people are going to play with what I do. And if that is not playable my other influence comes from the popculture. And also a part of my own culture comes from Movies, comics, manga,… So I think that the supernatural have a part of influence on me. Generactive : Speaking of inspirations, I want to know how you transfer them to your work. I guess my question is about your general work process. Does a certain technology or a platform give you an idea that you’d like to work on? Or do you have an idea and then seek for tools to execute it? Or is it all combined process? Fourneau : Most of the time it’s a combined process. I need to touch material or code to think. The Idea of WLG emerges may be 8 years after the first time when I used water in an electronic project. I have many ideas in my mind and not enough time to try everything. So I wait to have all the right ingredient in hand to launch me. In the case of WLG I also need funding to make a bigger wall and not only a small prototype. Generactive : There is a strong sense of playfulness in your work and your art is often in the form of a game. Where does this come from? Fourneau : Born in the eighties, play to board game and video games. But mainly born in era where the code was teach in school. I touch a first time a code in the primary school. And I always remember the feeling to give a life in a digital turtle.After my french high-school diploma when the question of what I want to do in the futur came. I was terrified, I’ve chosen an informatic school without real idea. after a month of learning the language ADA and count words in database. I felt that this area of programming interested me but I was not in the right place for creativity. With a stroke of luck, an artist talked to me about an art school where there were different fields : 3D, sound, robotic, programming in addition to traditional creative fields. It was the Aix-en-Provence art school. I integrated this school and I think it was the right place at the right moment to help me. I think the practice that I developed there would be never support in another school. I could have fired me the 1st year in other context. Generactive : I recently met one artist who said that she was going through what might be a midlife crisis. She said she was working on her art, but doing so without SOUL! For someone like you, whose work shows a strong sense of love and joy in it (Not just that your project instills joy into the audience, but I can see that you must have had a lot of fun conceptualizing and creating the piece), do you ever run into “artist’s block” like this? If so, how do you tackle these moments? Fourneau : the question of soul in my creation come every times. And even more when a creation is played with the public. if someone makes a beautiful sketch on the WLG. is it still my creation? My part of job is to cause excitement in the public mind. for me it is very important to meet people opinions and discuss this strange practice that I develop. I think that part of my creative approaches increasingly now to a designer practice. Generactive : Interactive media seems like an everyday term these days. Now that more, and even most, people in the world are using interactive media in some way, the question for artists has become “how”, “why” and for “what” do we use it. What does it mean to you to work with interactive media and technology? Is it just a small part of your bigger creative practice? Why are you in this field? Fourneau : I’ve always lived with media that move and live.It is therefore a sort of clay for me too as painting for a painter. Today is a material like any other and that leads to a way of thinking. we do not think in the same way with paint on hand or with a tablet or with a keyboard. But we stay same person with the same influences. Generactive : Is there a routine for you that you do to push yourself forward as an artist in the field? Do you try to learn new skills every now and then? Or is “working with technology” natural for you (embedded in your DNA)? Fourneau : I’m a fairly lazy actually. When I have an idea that comes to me but asked me to learn too many new things. I find it too complicated at once. And I’d rather get an easier way to achieve it. I wish it was in my DNA. But at the same time I feel that for some people the technology is time consuming. I often spent a lot of time on a technical problem. And the mere fact of trying to solve this problem suffiser me mentally. But I actually lost a lot of time. If you do not want to be an engineer but a designer or artist in this field. I think it takes a minimum know what will be the job of the engineer who will help you. Generactive : Is there a new project that you are working on right now? If so, would you like to tell us a little bit about it? I’m working on a book about my project Eniarof the fun fair (www.eniarof.com). Certainly the project who asked me the most time. Precisely because the code is not enough in my DNA. But at the same time it has some interesting maturation in a project that you carry for so long. Generactive : Is there any project, artist or idea you recently found, or have always admired, that you would like to share with us? The post Interview with Antonin Fourneau appeared first on generactive :: generative + interactive + art + design. Interview with installation and new media artist Sam Van Aken. The post Interview with Sam Van Aken appeared first on generactive :: generative + interactive + art + design. Through responsive dance, [radical] signs of life externalizes the mind’s non-hierarchical distribution of thought. Music is generated from the dancers‘ muscles and blood flow via biophysical sensors that capture sound waves from the performers’ bodies. This data triggers complex neural patterns to be projected onto multiple screens as 3D imagery. As the audience interacts with the images produced, they enter into a dialogue with the dancers. The post [radical] signs of life appeared first on generactive :: generative + interactive + art + design. Chelpa Ferro is well known for squeezing a rhythmical sound from seemingly non-musical devices such as electric toothbrushes, drills, sewing machines, or juice makers, and using them in their installations and performances. At The Aldrich, the Acusma installation will fill the gallery with a sound resembling a group of people coming together to sing. However, the sound does not visually match the source, which turns out to be a series of beautiful Brazilian ceramic vases spread out on the gallery floor, with loudspeakers playing up to five different recorded voices inside each vessel. The post Acusma | Chelpa Ferro appeared first on generactive :: generative + interactive + art + design. Waveforms is an exhibition of interdisciplinary art works showcasing sound as the principle component. This exhibition explores, through an examination of creative and artistic practices, the interface of sound and new media technologies. The works in the exhibit include a number of trans-disciplinary interactions and collaborations that include sound in the context of visual and spatial artistic practices, including sound sculpture, installations, and performance works. Featured artists include Carrie Bodle, Jacob C. Hammes, Norbert Herber/Rowland Ricketts, Tesia Kosmalski, Lou Mallozzi, Shannon McMullen/Fabian Winkler, Stephanie Rowden, and Jesse Seay. The list includes both emerging and established artists, primarily from the Midwest. Norbert Herber, artist and faculty member at Indiana University, will moderate the Symposium/discussion. Because this exhibit is about the exchange of thought among a variety of disciplines, it will highlight the role that artistic practice and creative thinking have in our appropriation and understanding of technology, including practice and dialogue related to changes within both the natural and man-made environment. By comparing material practices in a variety of creative fields, new insights are gained into the way that artists and collaborators recognize the “new” and how the “new” becomes a building block for future discoveries. The post Waveforms | The Art of Sound appeared first on generactive :: generative + interactive + art + design. “Pulse Park” is comprised of a matrix of light beams that graze the central oval field of Madison Square Park. Their intensity is entirely modulated by a sensor that measures the heart rate of participants and the resulting effect is the visualization of vital signs, arguably our most symbolic biometric, in an urban scale. In Pulse Park, evening visitors to Madison Square Park have their systolic and diastolic activity measured by a sensor sculpture installed at the North end of the Oval Lawn. These biometric rhythms are translated and projected as pulses of narrow-beam light that will move sequentially down rows of spotlights placed along the perimeter of the lawn as each consecutive participant makes contact with the sensor. The result is a poetic expression of our vital signs, transforming the public space into a fleeting architecture of light and movement. Pulse Park is inspired by Roberto Gavaldóns film Macario (Mexico, 1960) in which the protagonist has a hunger-induced hallucination wherein individuals are represented by lit candles, as well as by the minimalist musical compositions of Conlon Nancarrow, Glenn Branca and Steve Riech. Pulse Park is the culmination of a series that Lozano-Hemmer debuted at the 2007 Venice Biennale with Pulse Room. The concept sketch was printed in an edition of 12 copies. The post Pulse Park | Rafael Lozano-Hemmer appeared first on generactive :: generative + interactive + art + design. Tim Hawkinson is known for creating complex sculptural systems through surprisingly simple means. Inspiration for many of Hawkinson’s pieces has been the re-imagining of his own body and what it means to make a self-portrait of this new or fictionalized body. Sculptures are often re-purposed out of materials which then artist then mechanizes through hand-crafted electrical circuitry. Tim Hawkinson is featured in the Season 2 episode “Time” of the Art21 series “Art:21 — Art in the Twenty-First Century”. The post Tim Hawkinson appeared first on generactive :: generative + interactive + art + design. This installation done by Sam Van Aken in 2006 was essentially realized through the stacking and attaching of home stereo speakers. The speakers combined into a wall that played a random sampling of the quote “oh my God” which spanned an emotional spectrum from horror to sarcasm to sheer ecstasy. Through the use of a computer program designed by the artist and a seemingly infinite amount of speaker wire and extension cord, the quote was looped to individual speakers increasing one at a time until the entire wall screamed “oh my God” in a variety of tones and contexts at the same time. Remarkably, the range of human emotions the artist captured using only this singular quote was reflected through the viewers’ laughter, disgust, tears, etc. Sam Van Aken is represented in New York by Ronald Feldman Fine Arts and Michael Klein Arts. The post oh my god | Sam Van Aken appeared first on generactive :: generative + interactive + art + design.